The Beehive kohteessa Rooma, Italia: Varaa nyt! Rome's homiest and most chill hostel since 1999, we're a sanctuary in the midst of a bustling city. From the moment you walk in, The Beehive is the kind of place where you'll feel at home. It's walking barefoot down to the cafe for your morning coffee; getting great advice; eating good food; drinking great wine and having a good night's sleep. 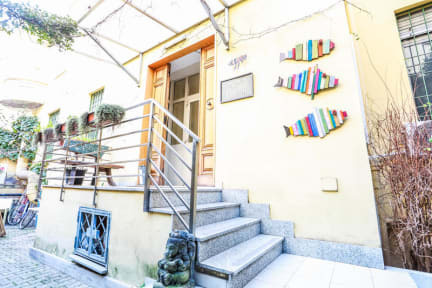 Located conveniently just two blocks from Rome's central train station, Termini, you won't have to lug around town a heavy backpack or luggage. Our relaxed vibe and casually stylish atmosphere are perfect for unwinding after a day of exploration. Owned and run by Linda and Steve, the American owners who packed up their apartment in Los Angeles and took a chance on a crazy idea. Along with their two cats and a Swiss Army knife, they moved to Rome to follow their dream of creating a unique and welcoming space where they could also share their local insider information to their guests about all the best Rome has to offer. Whether you're traveling solo, with friends or family, or as a couple, The Beehive has a variety of room types to suit all needs and budgets: dorm beds (including several female only dorms), private rooms with shared bathroom and private rooms with private bathrooms. Our cafe serves organic & vegetarian breakfast daily, communal dinners twice a week and we offer weekly cooking classes. Wine, beer, coffee, tea, and desserts are available from our reception staff throughout the day. Guests have access to limited self-catering kitchen facilities. 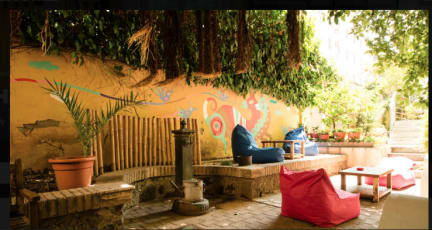 Relax in the small indoor lounge filled with personal photos, books, boards games and a guitar or out in the beautiful courtyard garden packed with colorful murals and comfy places to chill out and enjoy the Roman weather as one should - al fresco.